Hi all, I'm kind of new to the group so I'd like to introduce myself. I bought it new in 1978 and drove it regularly until about 1984 when I decided it was too dangerous to drive it regularly here on the Houston, Texas roads. I've always stored it properly so it really isn't hard to reanimate. The only major problems that I've had with it has been a little dirt in carb number 2's idle circuit, and the mufflers rusting through after only 3 years. After cleaning it out carb 2, I was able to use my mercury manometer carb-stix to ballance the carbs. Cleaning out the # 2 Carb cured a problem where I thought I had ruined my engine using Lubrilon TFE additive during the first 1000 miles of the bike's life. The Lubrilon TFE collapsed the oil filter element and breakin particles flowed freely though the engine. The bike seemed to smoke a lot after being ridden on the freeway. It turns out it was just burning the cylinder #2 unburned deposites collecting in my Kerker 4 into 1 pipes. I've never been too happy with the XS1100's 280 Watt output. I could never run my driving lights very long without discharging the battery to the point that I'd get stuck having to use the emergency kick starter. A few year back I was impressed by the driving lights of my neighbors car. Every time she drove down our street at night, her lights made it look like day light. She told me that they were high intensity discharge lights. After that, I started investigating if they were available over the internet. 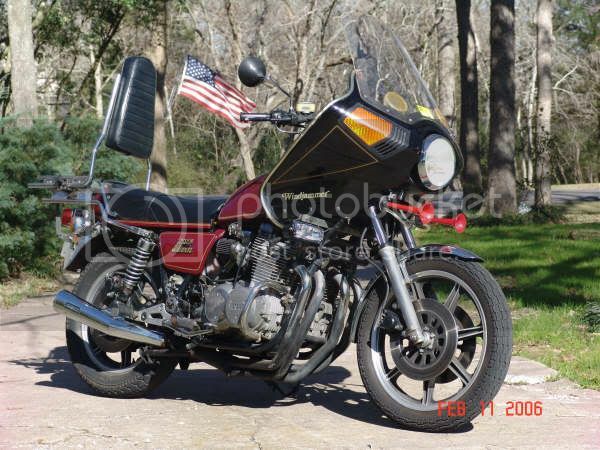 The first ones I saw several years ago were more expensive than my 1978 XS1100 was valuable. 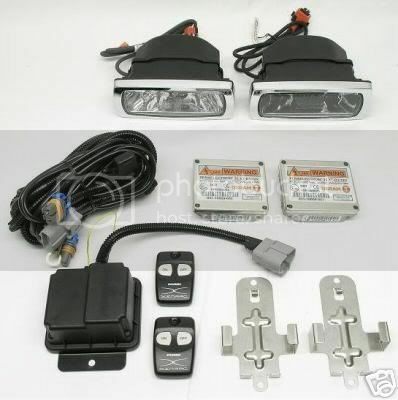 Recently I found some Sylvania Xenarc X1010 HID Xenon Fog/Driving Lights on eBay for $245. Info from the mfgr: "This system is the only High Intensity Discharge designed to legally supplement your existing headlights (whether halogen or HID). The D1S Xenon bulb offers REAL HID performance: 3-4 times the light output of any halogen headlamp bulb, 10 times the life span, And uses 33% less power!" That "33% less power" got my attention since the XS11 only generates 280 Watts. Each HID bulb/ballast consumes 35W. I pulled off the pair of 100W Quartz Iodide driving lights and had to figure out how to attach the Sylvania Xenarc X1010 kit. Since the Xenarc X1010 kit is activated by a hand held remote, I connected it to the XS1100's positive battery terminal through an added horn relay that closes only when the XS1100's ignition key switch is turned on. All I had to do was find a wire that went to 12 Volts when the ignition switch was turned on. I spliced a wire into it and ran the spliced wire through the horn relay's driver coil directly to ground. 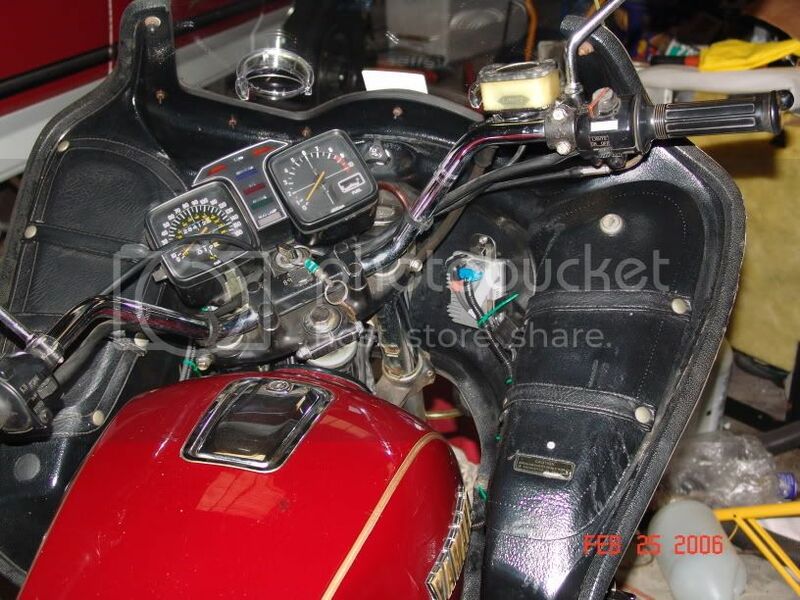 I then connected the Xenarc's fused power line through the horn relay to the positive terminal of the XS1100's battery. Although I have to press the hand held remote button to turn the lights on, turning the XS1100's ignition switch off also turns off the added horn relay and the Xenarc X1010s too. I mounted the Xenarc lights to the metal brackets I fabricated to mount my original quarts iodides. What a difference they've made to night time driving safety. 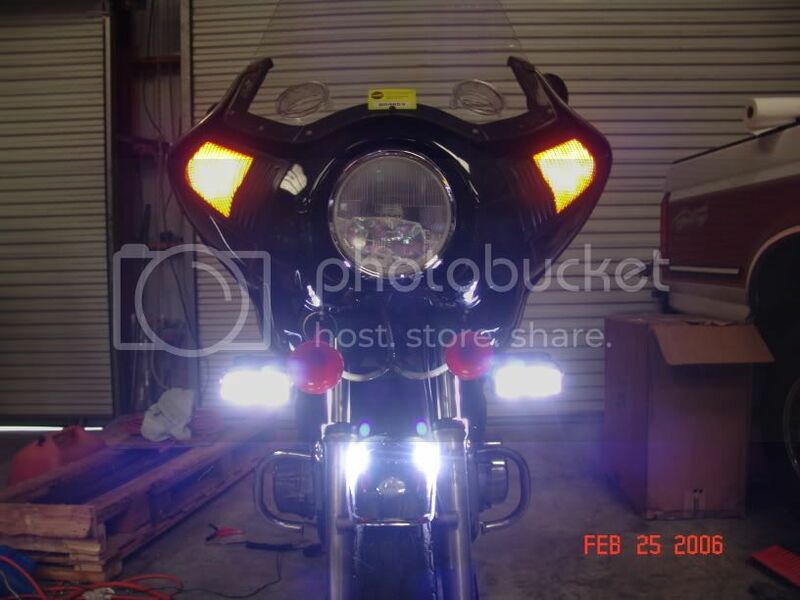 Plunking down $250 for some lights is hard but if they keep me out of an accident they're worth every penny. Anybody else have any lighting improvement suggestions?